At Least 4 Killed, Including Gunman, In Workplace Shooting At A San Francisco UPS Facility : The Two-Way The shooter opened fire at a UPS facility just as the workday was getting underway, prompting chaos at the company's building. A company spokesman says the gunman was a current UPS employee. 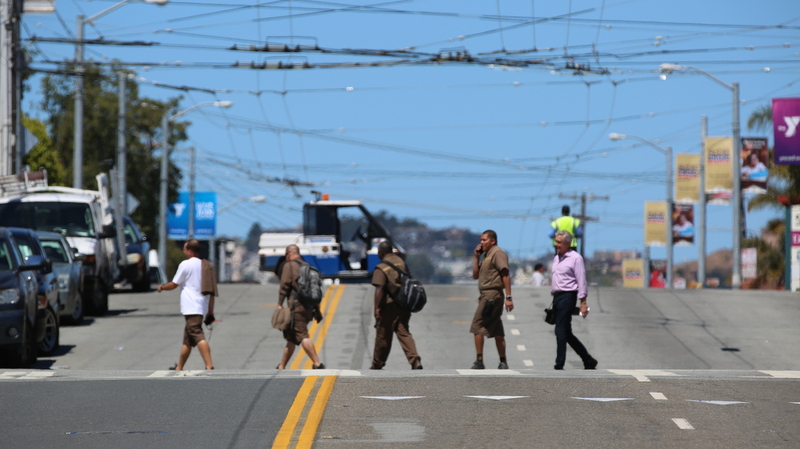 UPS employees cross the street shortly after a shooting at the company's facility in San Francisco. According to law enforcement, the suspect killed himself with a gunshot to the head. A gunman opened fire at a UPS facility in San Francisco on Wednesday morning, killing three people and later dying of a self-inflicted wound, police say. The shooting, which unfolded on the eastern edge of the city's Mission District, began at around 9 a.m. local time, just as the workday was getting underway. Authorities said the gunman was wearing a UPS uniform. Company spokesman Kyle Peterson tells NPR that the shooter was a current UPS employee. Two other employees were injured in the shooting, Peterson says. "Hayward Cook, who described himself as a UPS human resources manager, said he was interviewing people in a conference room when he heard five gunshots. "Cook said he heard another series of five shots before the area fell silent and he escaped from the building with others." "Officers encountered shooting victims and immediately evacuated them to a safe location to get medical treatment," law enforcement said at a news conference. Officers then confronted the suspect, "who was still armed with an assault weapon. The suspect put his gun to his head and discharged his weapon." "The company is saddened and deeply concerned about affected employees, family members and the community we share," UPS says in a statement. "Our thoughts and prayers are with all those touched by this incident." "We are always saddened by the loss of life to gun violence," Mayor Ed Lee tweeted Wednesday after the shooting. "Any shooting is one shooting too many."